3 AM. I’m in bed. Wide awake. I’m not worried about a thing, yet I‘m surely not falling sleep anytime soon. I know a thing or two about sleeplessness. My body is drawn into the yoga posture known as Child’s Pose (face down, knees drawn alongside the ribcage, in wide-knee fetal position). I’m hugging a pillow underneath my chest. I crawled into this position automatically, before I was fully awake. It’s become a habit. I find child’s pose hugging a pillow whenever I start to wake in the middle of the night. And this is a good thing. Insomnia. One of the primary buggaboos that chased me into a yoga class decades ago. I had dealt with insomnia for most of my life— even, I’m told, as baby. I’m a yoga teacher who experiments with ways yoga can be “applied on the fly” to help life be easier and more comfortable, if not downright joyous. Over the years, I’ve found three indispensable yoga postures that work together to help ease sleeplessness, especially interrupted sleep. My interest in interrupted sleep isn’t just about my aversion to dark circles under my eyes. My curiosity was piqued by the scarcity of information available about how yoga could help interrupted sleep. While articles with titles like “Yoga Before Bedtime” cover the internet like a blanket, yoga for the darkest hours of the night isn’t talked about. Why? Hard to believe I’m the world’s only yogi challenged with interrupted sleep. Anyway, I’ve shared these three poses with numerous people over the last few of years. 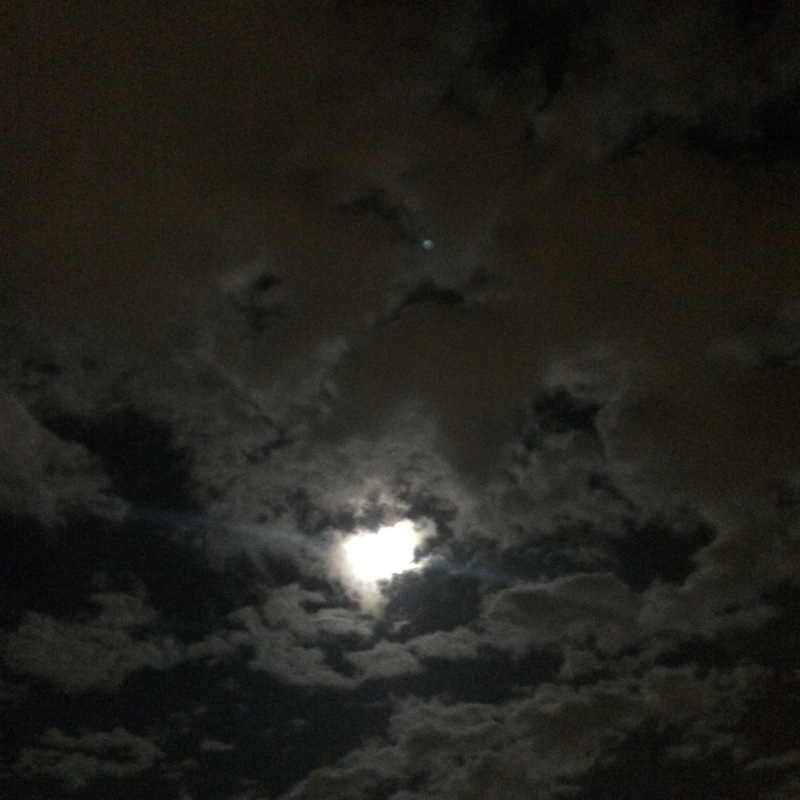 Each person reported the practice eased their sleeplessness to some degree. When I see these people, the evidence is visible in their brightened eyes and mood. In this post, I’m sharing these poses as well as some insight into how I use them. First of all, a couple of things to know about interrupted sleep. Waking in the middle of the night might be a signal that some deeper issue is going on in your body. We’re lucky to have bodies that send us signals and clues about what’s going on below the surface. Some common signals are: hunger pangs when we need to eat, a dry mouth and throat when we’re thirsty, or yawning and heavy eyes when we’re sleepy. Now for the three postures and how to practice them. Child’s Pose: Lie face down and draw your knees wide alongside your ribs or more narrow under your abdomen. Hug a pillow and turn your head to the side. Perhaps the power of this posture is in our DNA. It’s the very first shape we hold as we develop in the womb. Children instinctively take this posture when sleepy. It feels safe, protected, cozy. We’re turned away from the outer world. 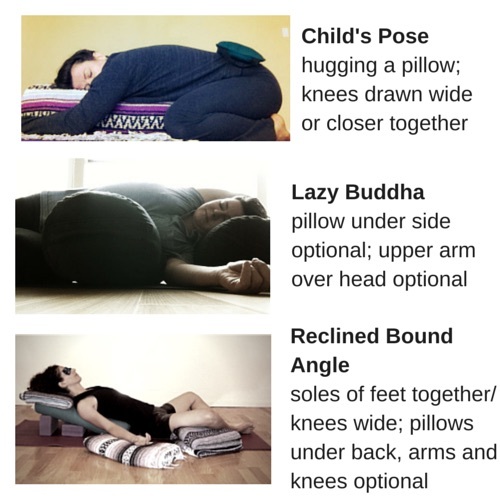 Lazy Buddha: Lay on your side, try a pillow under your lower side waist (optional) and one under your head. You might also try a pillow between your knees. Arm up and over head as in the photo or resting in front of the body, maybe on a pillow. Many people say that side sleeping feels more natural than sleeping face up or down. Sleeping on the left side can also help alleviate heartburn and acid reflux. Otherwise, sleep on the side that feels most comfortable. This posture is very effective for easing anxiety. Reclining Bound Angle: On your back, soles of feet together knees wide. Feet can be close to groin or as far away as you like. Arms in any position such as: alongside the body; arms extended wide; or arms around the head in a diamond shape, palms up. Pillows under back, arms and knees are optional. This gentle hip opener nurtures digestion and a feeling of openness and freedom in the lower body. Straighten the legs whenever they feel ready to extend, but the rest of the body can stay in the posture for a very long time, if desired. 1. During interrupted sleep, try them in any order that feels right. Begin with the posture that feels most comfortable and/pr relaxing and go from there. Repeat those that that feel most relaxing/comfortable. 2. All postures have certain effects on the mind and body. You can practice these postures before bed to help you fall asleep, but this practice is particularly dialed in for getting back to sleep after waking up during the night. 3. If you’ve never practiced yoga, you might want to take some classes, or better yet, do a private lesson or two with a good teacher to really address your unique situation, body and other needs more quickly and effectively. 4. Use pillows and blankets to support you just as the bolsters and blankets are used in the photos. Unfortunately, there’s no magic bullet for sleeplessness. But yoga definitely helps me go to sleep, stay asleep and fall back to sleep if I wake during the night. Very important to note: this practice has a cumulative/exponential effect. The more consistently I use this practice during interrupted sleep, the more effective it becomes. One sleepless night, melting like butter into the second posture within this sequence, I realized how lucky I was to have the tools to work with sleeplessness. I wondered why I’d never shared the sequence in a blogpost. I’d shared bits of it in classes, customized it to the unique needs of private clients and had even incorporated it into Thai massages, but had never shared it on the web– where it could help countless sleepless people. But here’s what’s special about this story. The next morning, the first email I opened was from a new mattress company called Casper. I had never heard of them at that time. The founder of the company introduced herself, said she liked my blog…she was looking for a good blogpost about doing yoga in bed! Like this post? Want more like them? Pop your name and email below.